As you can see, it depicts a cozy living room, where the owners are ready to have some tea and cupcakes – unless Cleo gets to them first! I’ve always been attracted to interior settings, some real, some imagined. I like to paint a place where I’ve enjoyed myself, or create one where I’d like to be. But so have many other painters, including such masters as Matisse, Bonnard and Hockney. Interiors provide a vehicle for self-expression, particularly if you love color, fabrics, still lifes and window scenes. Several other Wilde Meyer artists share these interests. 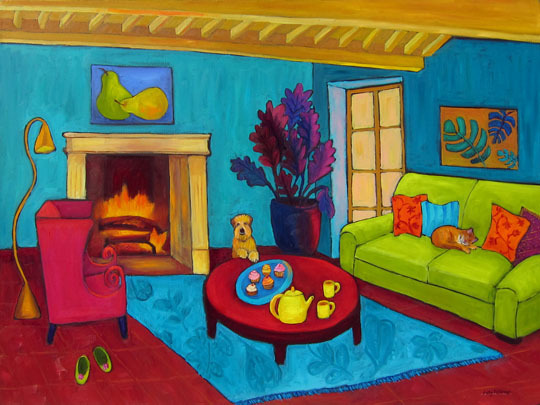 Diane Barbee uses interior furnishings to express her joy of color and her optimism about life. She, too, likes to create her own world through painting. 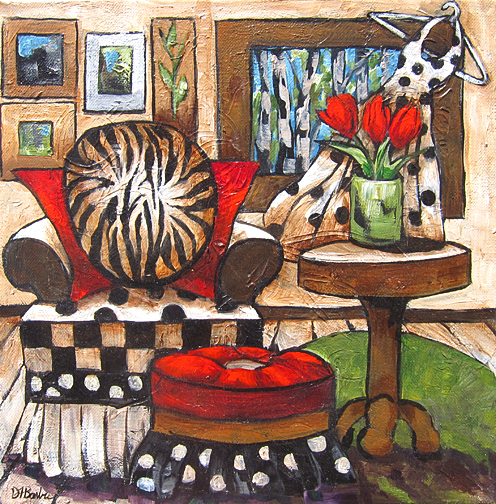 In “Round Zebra Pillow,” Diane combines images of things she likes: a funky chair and ottoman with a giant zebra skin pillow, paintings of landscapes and a polka dot dress hanging jauntily from a window. 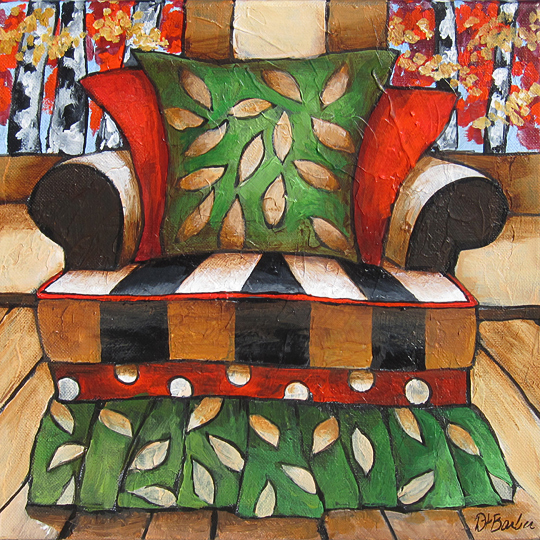 In “Never Leaving,” she zeroes in on the chair itself, using fabrics in colorful, complimentary colors. 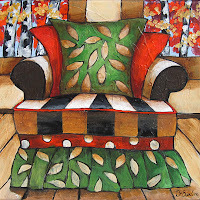 The diverging lines on the chair cushion and the wood floor take our eye to the back wall, where there is more pattern. Freshness and surprise are qualities that come to mind when viewing Diane's work. She believes that life should be full of wonder and inspiration. Her philosophy allows her to enjoy a variety of subject matter. Considering herself an expressionist; she uses color to convey that and her subject matter is a vehicle to that end. Diane is an eternal optimist and hopes to bring that optimism to every painting she creates. Lori Faye Bock also has a personalized vision of interiors. In “My Real Life Big Screen TV,” she presents us with a view from a dining table of a fanciful, walled garden. 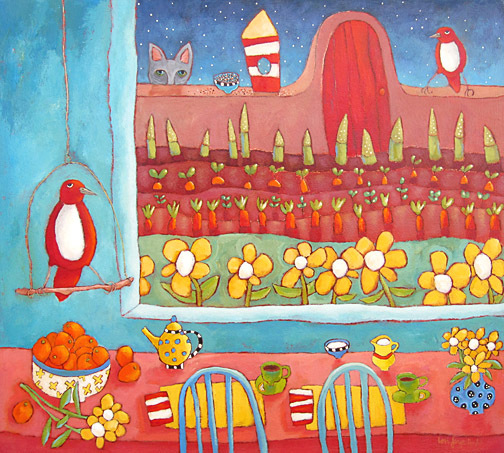 Everything in this painting is interpreted in a whimsical way. 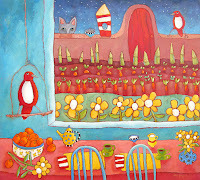 The bold colors and the simplified furniture, flowers, vegetables and animals express an endearing wonder. You could say it’s child-like, but I think it’s more sophisticated than that. The late Jacqueline Rochester expressed her love of interiors in a more tranquil way. 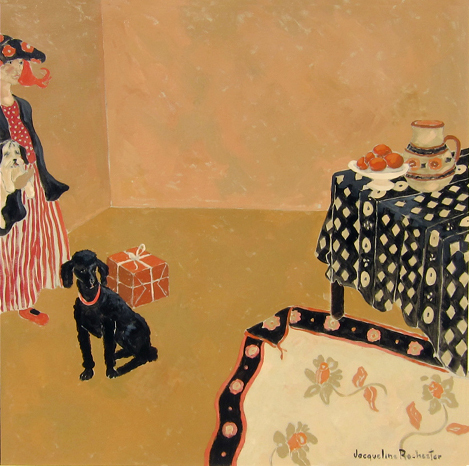 Her color palate is softer, and although she does use patterns in some paintings, they do not affect the viewer in the same way as those in Diane’s paintings. For example, in “The Present,” the patterned tablecloth, scarf and woman’s dress all catch our attention, but they are not the focal point. Our eyes go to the dog and the gift behind him. The angles of the scarf and the wall corner direct us to the focal point. In “Country House,” the pale pink interior is so soothing, beckoning us to come in, rest and bask in the rays from large sunlit windows. 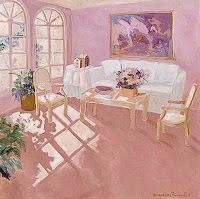 All these artists have their own personal style, but I would say that those of us who love to paint interiors aim to convey a feeling of contentment and joy to our viewers. 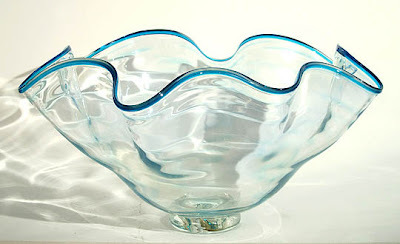 The year 2012 marks the 50th anniversary of the development of studio art glass in America. To celebrate this milestone and recognize the many talented glass artists, many glass demonstrations, lectures and exhibitions will take place in museums, galleries, art centers, universities, organizations, festivals and other venues across the United States throughout 2012. Here’s a brief history of the glass art movement, taken from a post from the Milwaukee Art Museum. “Fifty years ago, in 1962, Wisconsin artist Harvey Littleton and glass scientist Dominick Labino introduced glass as a medium for artistic expression in two workshops at the Toledo Museum of Art in Ohio. 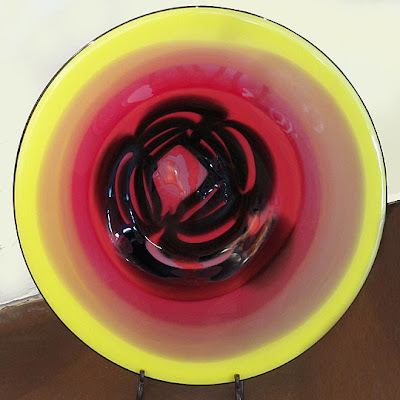 Littleton and Labino developed small furnaces and a glass formula with a low melting point, making it possible for individual artists to work with glass outside of an industrial setting. 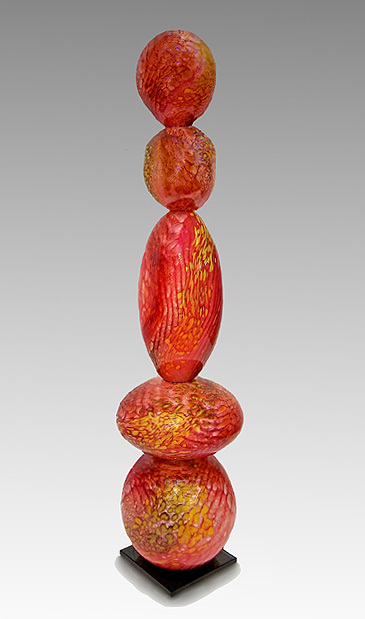 In 1963 Littleton taught the first glass-blowing class in an American college at the University of Wisconsin–Madison. In Scottsdale, glass artistry by some of Arizona’s finest artists will be featured during the “Glass Act” art walk on Thursday, April 12, from 7-9pm. Tom Philabaum is a veteran accomplished glass artist. 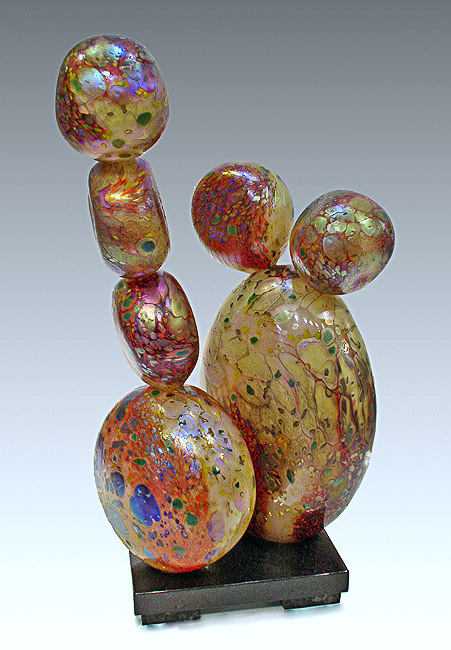 He built his first glassblowing studio in 1975 in downtown Tucson, and opened a gallery in 1982. 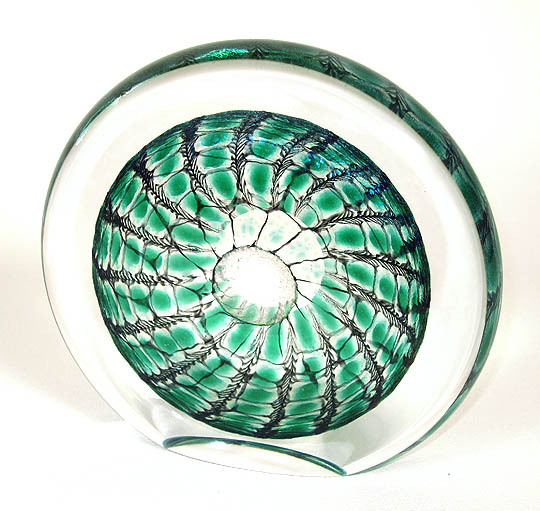 Since that time, the Philabaum Glass Gallery has been showing artists from across the country. Tom continues to spearhead the studio of blown glass, and the more current sculptural and site specific art, using a broad array of techniques, including kiln casting, fusing, slumping, and dalle de verre. At Wilde Meyer, you can see pieces from his Precarious Rock Series. Some have scavo surfaces, a difficult Venetian glass-blowing technique that results in giving a blown glass object the appearance of an artifact dug-up after centuries. (Scavo means unearthed in Italian.) 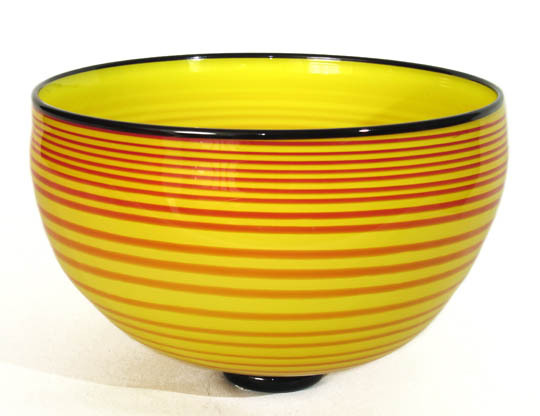 Others in the series celebrate bright color combinations. The precarious notion comes from the fact that the “rocks” are faceted and laminated in seemingly gravity-defying positions. 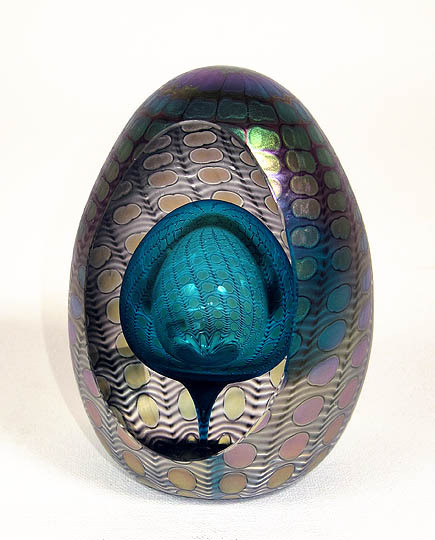 Colores also shows paperweights, vessels and disk sculptures made by Tom, such as Teal Egg, Rock Bowl and Large Jade Disk. I think that glass artists and collectors are all interested in the effects of different lighting on glass. 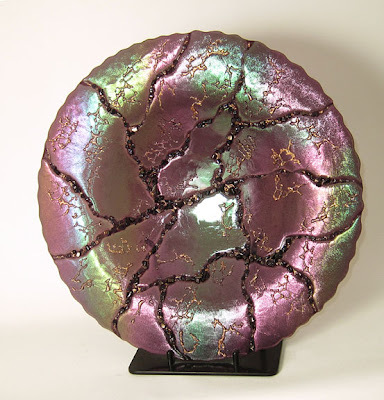 These changes give glass art life and make it different from two-dimensional work. Sandy Pendleton’s glass pieces have an iridescent quality to them and many textured surfaces that allow light to bounce around. Sandy notes that they change with the light over the course of a day and become more dramatic in the evening. I can see this happening with her “Violet Geology” Bowl and her “Sapphire River” piece. 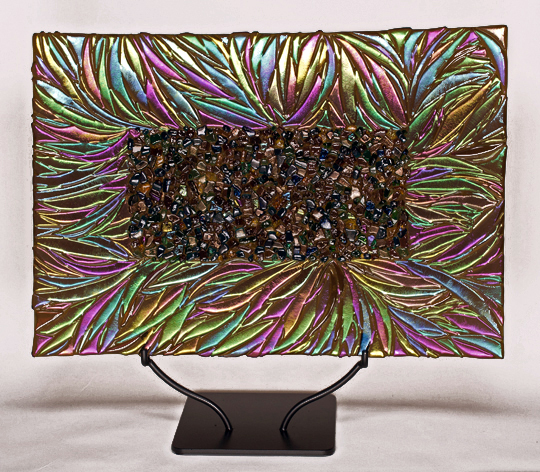 After a lifetime of artistic work in other media, Sue Goldsand discovered fused glass and knew she had found her passion. 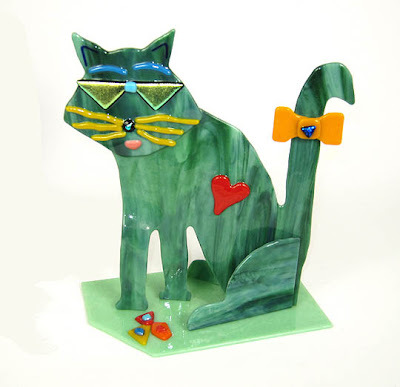 She likes this medium because it allows her to use strong colors and bold designs to depict her charming animal figures. Each piece has its own personality. 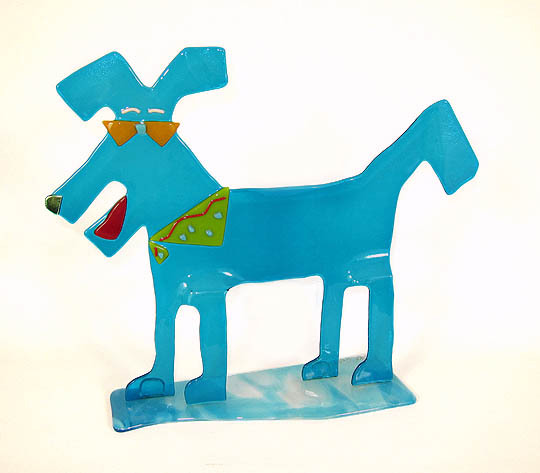 “Teets”, her colorful bird, “Blue Standing Dog” and “Cool Green Cat” are examples of her work. 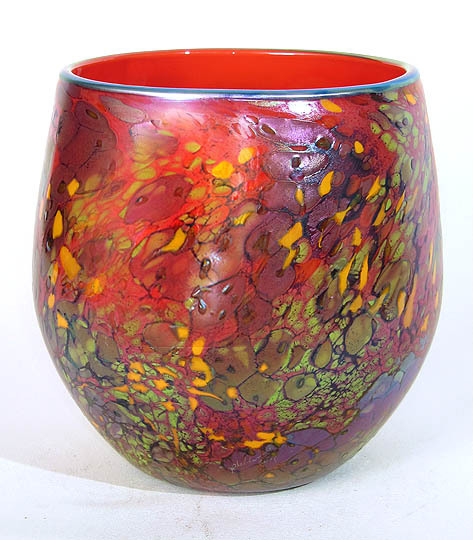 At Wilde Meyer, Dave glass bowls and display plates are beautiful examples of his proficiency in this medium.